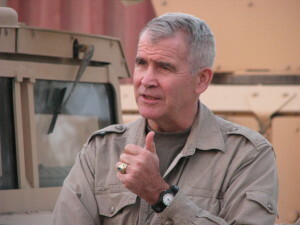 North was a U.S. Marine lieutenant colonel assigned as chief aide to Vice Admiral John M. Poindexter, national security advisor to President Ronald Reagan. In the 1980s, the Reagan administration wanted to support the “contras,” a right-wing military group opposed to the Marxist Sandinista government of Nicaragua. When Congress barred such aid, North, with Poindexter, formulated a secret plan by which the United States would sell arms to Iran (a terrorist nation and sworn enemy of America) in order to persuade it to help secure the liberation of U.S. hostages held in Lebanon. Additionally, the proceeds from the arms sale would be funneled to the contras, without the knowledge of Congress. Exposure of “Iran scam” or “Iran-gate”—as the press called the affair—in 1986 threatened to topple the Reagan administration and resulted in the prosecution of North (convictions were later dismissed).